Your point regarding coaching the kids in netball is so true that it kind of scares me. Recently I found out that one of my friends who graduated as a dentist four years ago decided to throw it all away and become a science teacher! What if I decide that I just want to play netball with all my bubsies and put my medical degree behind me? What is also satisfying to know is that I managed to speak in Malyalam quite decently in our latest episode with Anjali. Even though it was just one word, I still felt the need to practice a thousand times in front of the mirror. But what I should have really practiced is the rest of the questions we prepared for her. 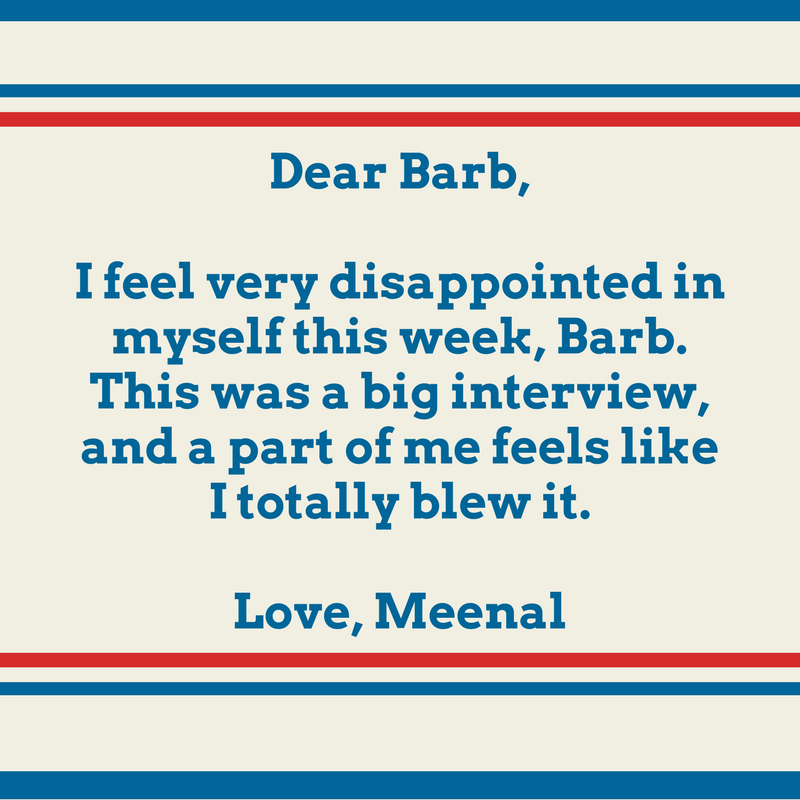 I feel very disappointed in myself this week, Barb. This was a big interview, and a part of me feels like I totally blew it. From my side, I did all the prep, the research, and I even recited the prepared questions the night before (something I don't usually do, because it doesn't feel natural to me during the actual interview). Ask me to wake up at 5am for a run? Ask me to wake up at 5am to study? Wake up at 5am to speak to Anjali Menon? OMG. WHAT DO I DO? Firstly, I would like to make it clear that apart from my nerves, I was terribly frightened of waking up my Dad so early in the morning, and even more frightened that my Mum would forget that I was conducting this interview and she would walk in with the aarti and sing her bhajans really loud. So that's one reason why I sounded very mellow and toned down at the beginning of the interview. Why did I say succex instead of success? I DON'T KNOW. I'VE SAID THE WORD SUCCESS A MILLION TIMES IN MY LIFE, BUT DURING THE INTERVIEW, I HAD TO MESS IT UP. So, now my dreams of Anjali casting me in a movie are definitely over, because I'm sure she doubts my ability to read script. Great. I guess I'll just be a doctor. And as for your mother-in-law, I'm happy for both of you.